The CHOICES at the Ridge day program participants know the importance of volunteering and giving back to their community – and take it to heart. 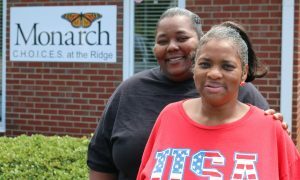 The 21 participants at the day program in Forsyth County contribute upwards of 450 volunteer hours each month to local organizations, according to CHOICES Community Engagement Team Leader Beth Myers. The day program coordinates their volunteer schedules and any one-on-one assistance needed. CHOICES at the Ridge participant Lynn Canty is no exception. Canty’s five-day-a-week volunteer schedule affords her a chance to give back to her community while at the same time helping people, which has become her passion. CHOICES at the Ridge supports Canty and others with intellectual and developmental disabilities (I/DD) through activities, programs and community volunteer coordination. Myers explains that one volunteer role in which Canty was recently participating wasn’t working out because she craved more social interaction than the role was providing. This resulted in Canty advocating for herself with the goal to pursue and research other volunteer options. Myers, along with Developmental Specialists Beverly Forte and Anna Reed-Hooper, researched other opportunities within the community that would appeal to Canty’s wish to have meaningful interaction with others. That resulted in volunteer opportunities with Winston-Salem’s Sunnyside Ministry, the SECU Family House and Danby House where she assists with a variety of tasks that are important to each organization’s day-to-day operations. Canty, 49, volunteers three days each week at Sunnyside Ministry hanging clothing that is distributed to the area’s needy, a role which she has maintained for two years. Canty visits Danby House, an assisted living and memory care facility, once a week. She provides residents with water and helps transport residents in wheelchairs from one room to another. “Lynn loves helping the elderly,” states Reed-Hooper. Her most recent assignment is at the SECU Family House and one she has quickly grown to love. Family House, a non-profit, offers family members of those receiving care at nearby medical centers affordable lodging, a home-cooked meal and fellowship, and operates primarily through volunteer efforts. At the SECU Family House, Canty vacuums, folds towels, sorts utensils, hangs decorations and bakes during her weekly visit. “This is her favorite thing to do,” Reed-Hooper says of Canty’s baking. Canty is quick to remind everyone that peanut butter or raisin cookies, and brownies are her favorite, too. “Lynn loves the interaction with other people staying at the facility and the staff,” says Reed-Hooper. “It makes me feel happy when I help somebody,” Canty adds. Reed-Hooper says Canty’s demeanor changes completely when she is doing something she loves and feels passionate about. “Helping others does a world of good for her,” Reed-Hooper notes. Myers, who has been working with Monarch for 18 years, also sees firsthand the positive impact volunteering has on participants. She believes that through volunteering the people we support understand real-life situations while creating important relationships within the community. “I tell them that they need to be committed to their volunteer role. They are relying on you to show up that day and help,” says Myers. Pictured: Developmental Specialist Anna Reed-Hooper poses with Lynn Canty, who finds many rewards in her local volunteer roles within the community.